It’s Christmas time, which means it’s party time! Do you have your event space lined up to mingle and dance the night away? If not, don’t miss the opportunity to book your corporate Christmas party at Centurion Conference & Event Center. We take the stress out of planning any corporate event. With our stunning venue design, flexible space, advanced tech, on-site catering, and exceptional service, you can relax and celebrate, even as the host! 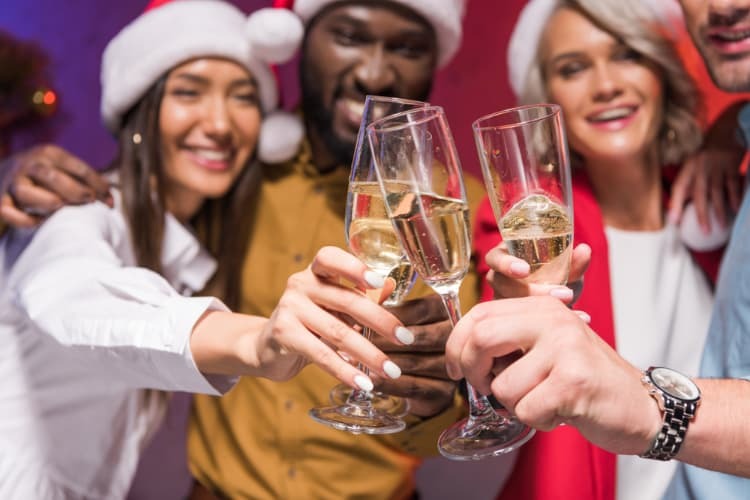 We guarantee that your Christmas party will go off without a hitch — here’s how. Whether your corporate Christmas party is big or small, our flexible space can accommodate. Our furnishings are also adaptable so you can comfortably host a formal holiday dinner or casual cocktail reception here. With our professional party planners on staff, organizing your private Christmas event has never been easier. Our event staff will take the time to understand your specific event needs and help you execute your plan with precision. Then our experienced and enthusiastic team will set the mood and provide personalized attention to ensure your party is a success. You won’t have to worry about arranging the food either! Our Executive Chef will offer a variety of fresh, quality menu options, and packages that are perfect for the holidays. Whether you want a five-course meal, appetizers, or snacks, we have several menu options to choose from, or you can create a customized menu to suit your company’s holiday needs. The Centurion Conference & Event Center has all the state-of-the-art technology could you possibly need to dance the night away. We use Advantage Audio Visual Rental Ltd. which can arrange large screen projection, sound systems, camcorders, and more. Everything’s taken care of to throw the party of the year! You’ll also appreciate our convenient location that’s easily accessible, no matter where your guests are coming from. Located right in Nepean, the OC Transpo Bus Stop is right outside our door, and the Ottawa International Airport, hotels, restaurants, and major highways are just minutes away. We also offer ample free on-site parking for all of your colleagues and guests. When you’re looking for the perfect location for your corporate Christmas event, our award-winning venue will ensure that every base is covered. From simple to elegant, our professional staff will make your corporate Christmas event planning a breeze. Make this one to remember — contact us today to secure your booking! Many of our clients book Christmas parties into January and even February — we can accommodate your schedule.